OXFORD, Miss. – The University of Mississippi has joined the Von Braun Center for Science and Innovation-University Consortium to help create a collaborative environment that channels the power of university innovation to tackle challenges in the areas of space and national defense. in 2006, VCSI is a nonprofit organization specializing in research and development that works to further the mission of key governmental stakeholders through a regional consortium of academic institutions. The consortium, a team of academic institutions offering unique capabilities in advanced technologies, engineering prototyping, and research and analyses, connects academia thought leaders to the needs of the federal government. 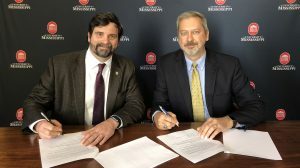 “The University of Mississippi is always looking for better ways to partner with our sister research institutions, so we are excited to join the consortium,” said Josh Gladden, UM interim vice chancellor for research and sponsored programs. UM was the first of several universities to join the consortium. The consortium is extending invitations to any and all research universities in the region surrounding Huntsville and recently has added the University of Alabama, Auburn University and Alabama A&M University to the consortium. As a nonprofit, the Von Braun Center for Science and Innovation created the consortium to facilitate communications between federal government agencies and universities. Also, the center integrates the universities to add synergy for solving complex problems, Crumbly said. “This understanding recognizes a mutual relationship of our organizations such that the VCSI will provide actionable information concerning research opportunities in the Huntsville region and represent the University of Mississippi as a contributing member of our consortium,” he said.